Fall protection is a complicated topic. Not only are workers’ lives at risk if the right measures aren’t taken, but the standards are difficult to understand. To top it all off there are many variations of equipment out there. And the requirements differ according to industry. For employees in the general industry, fall protection is required when working at heights 4 feet above a lower level, while in the construction industry fall protection is required at working heights of 6 feet. Let’s take a look at the different types of connectors in fall protection systems and see if we can simplify this complicated piece of equipment. Shock-Absorbing Lanyards: Contracts from 6' to 4' to greatly reduce the chances of tripping, snagging or dragging. Smoothly expands up to 42" to reduce fall arrest forces. Outer heavy-duty tubular jacket serves as a backup web lanyard. Unique warning flag provides visual proof that a lanyard has been involved in a fall and should be removed from service. However, it is very important to note that you MUST have 18.5 feet of clearance in order to use these! Self-Retracting Lifelines (SRL’s): Otherwise known as personal fall limiters, these are designed to be used with overhead anchor points. These connectors have the ability for the webbing or cable to retract back into the housing. In order to meet ANSI requirements, they must activate and stop within 4.5 feet. Please note that specialty SRL's with leading edge capability (SRL-LE) can be used at foot level. Fall Protection Systems: Alternative to double-leg lanyards and reduces fall clearance for use in more applications. 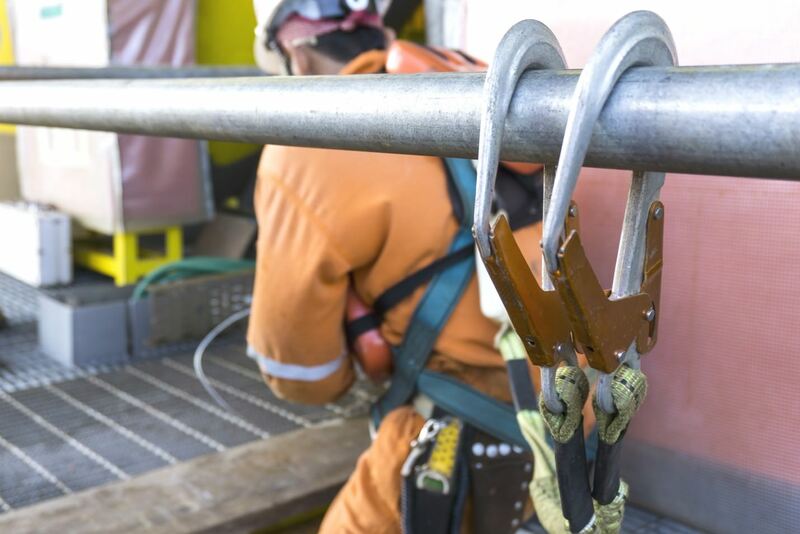 Connect to harness webbing below the D-Ring and free harnss D-Ring for rescue and connection to overhead self-retracting lifeline. PFLs swivel independently for increased worker mobility and prevents webbing from twisting and binding in the unit. Important Numbers to Remember with any Connecting Device! Due to the arresting capability of SRL’s, they can lock up quickly which decreases fall distance and increases the chances that a fallen worker can rescue themselves. The shorter distance also increases the likelihood of a rescue device successfully being used to hoist them back up to safety. SRL’s work much like a seatbelt; stopping forces and decreasing freefall distances. The lesser the fall, the greater chances of survival. It shouldn't be rocket science that we need to choose connectors that match the fall distance we are working with, as well as their potential attachment point. But when you are dealing with complicated equipment, it isn't always as straight forward as it seems. When working at heights of 4 to 6 feet, you could imagine that not all types of fall protection are going to actually protect the user in the event of a fall. When using an SRL in these applications the anchor point must be positioned overhead. The weight of the worker will also have an impact on the SRL’s payout, so make sure to accurately calculate fall clearance. And if you don't know, its time to find out before someone gets hurt! Other examples of fall protection may include what is referred to as passive fall protection. So, what is passive fall protection? Well, these are devices or equipment that are stationary and do not require participation from the worker. These are preventative engineering measures that should be in place and include handrails, guardrails and barricades. One of the most important things that needs to be done before using any type of fall protection or connector is to examine for damage, abuse or if there is any degradation of any of the materials that make up the system. A competent or qualified person should be designated that can inspect equipment and identify safety concerns. Don't just leave it to chance. The Safety of your Workers should Never be an Afterthought!